It’s no secret that 3D GPS-enabled construction equipment plays a central role in our remediation projects. We were the first UK environmental contractor to adopt the tech, and own one of the biggest in-house fleets of intelligent plant in the country. We also dedicate hundreds of hours to training our operators to use the equipment to its full potential. What may be less obvious is why we invest so much in the technology. And, most importantly, the benefits it provides for our clients. What is 3D GPS-enabled construction equipment? Put simply, 3D GPS-enabled construction equipment is a combination of GPS satellite technology working with sensor-enabled machines, such as excavators, dozers and rollers. As well as allowing us to pinpoint a machine’s exact location, 3D GPS enables us to carry out tasks such as bulk earthworks, fine cut/fill grading and detailed, isolated excavation work - all while design and as-built data is transferred from site to our offices in real-time via. online Sitelink technology. This highly accurate data is met by our team of engineers, who can troubleshoot any issues and ensure works stay on track. 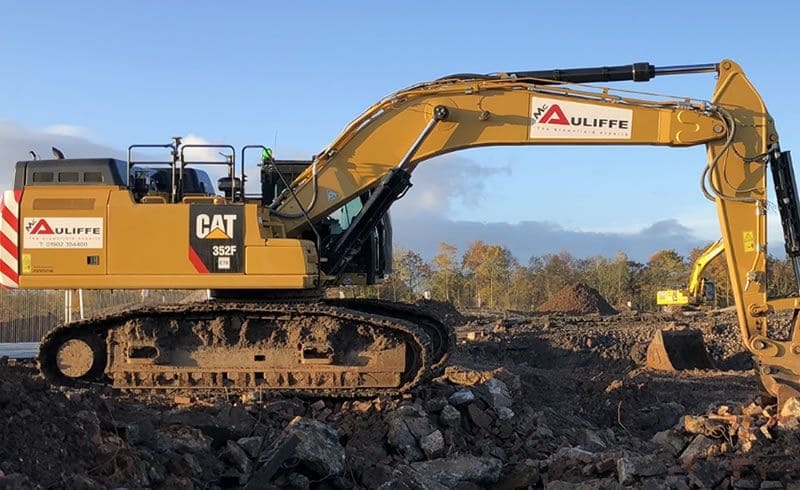 Machine control removes the need for engineers and operators to enter dangerous areas, such as deep excavations and controlled asbestos zones. An in-cab display shows operators the exact positions and depths of contamination, underground services and hazardous areas from the safety of their machine. Positional control limits the height extent of booms and slewing restrictions. Materials Management Plans, Environmental Permits and NHBC verification reports are becoming increasingly complex. Highly accurate, real-time reporting - including as-built and validation samples from surveying sample geotechnical locations and dig levels – solves many issues surrounding this. It also supports regulatory approvals and completion of timely final validation reports. A 3D GPS-enabled dozer or roller can quickly and precisely survey large areas, providing accurate data on finished construction platforms to build confidence in final reports. 3D GPS allows us to zone site areas by contamination concentrations, selectively excavating soils for treatment and avoiding removal of surplus soil from site. Information is amended as site works progress to implement new soil contamination data, which affects the delineation of site contaminants. Upload of detailed digital terrain models, services and remediation grids to machines ensures works are planned and accurate. Desk-based survey engineering using 3D GPS means less site time for engineers, which has cost and time benefits. Real-time data transmission allows our engineers to pre-empt any issues and keep the project programme on track. Excavations are controlled to +/- 30mm accuracy, with planned, highly accurate excavation enabling more precise delineation than traditional setting out. Soils that don’t require excavation are left in-situ, enabling more sustainable building solutions, with less ground disturbed and lower fuel consumption per m2. Fewer engineer trips to site helps cut carbon emissions and congestion. 3D GPS technology combined with hybrid machines drives up to 30% fuel efficiency compared to standard non-intelligent models. There you have it. Some of the key ways 3D GPS-enabled construction equipment can benefit your project.